Consider the following scenario. You purchase (2) Data Domain DD640 appliances, one to be deployed at your production site and the other at a DR or some other remote site. 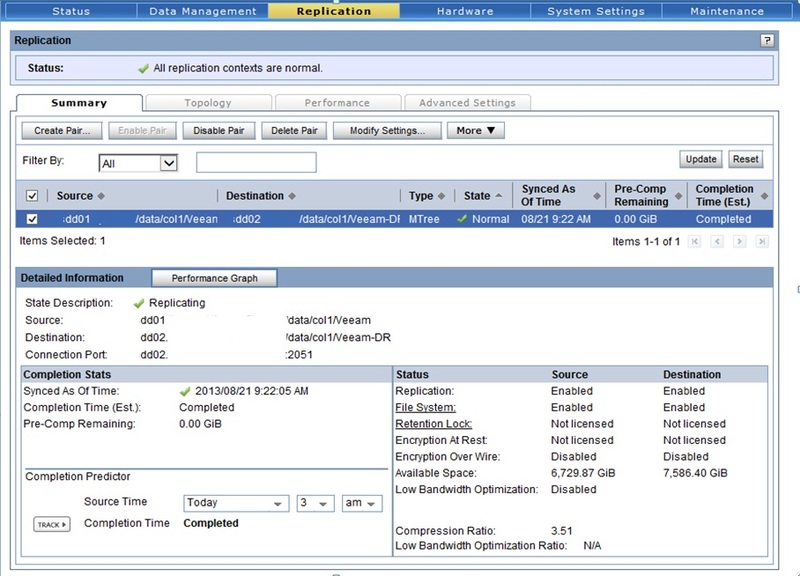 The DD 640s will also serve as the backup repository for Veeam Backup and Replication, which is being used to backup VMs hosted on VMware servers and the organization has a desire to replication the Veeam backup data from DD01 to DD02. 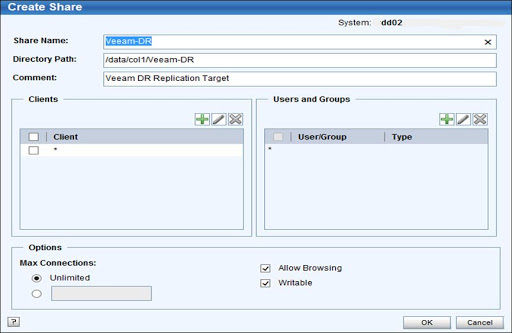 DR and redundancy for the Veeam backup data can be accomplished by using Data Domain replication to replicate the \\DD01\Veeam CIFS data to \\DD02\Veeam-DR. 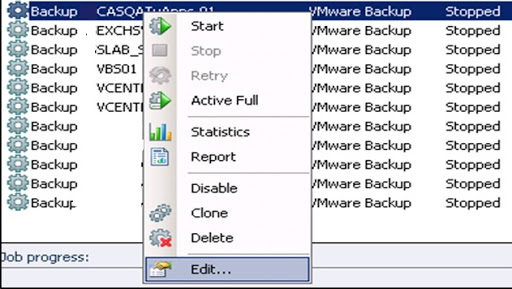 In this example, I’ll use Data Domain MTree replication to replicate data from DD01 to DD02 and show you how to access backup data should DD01 experience a failure. 2. 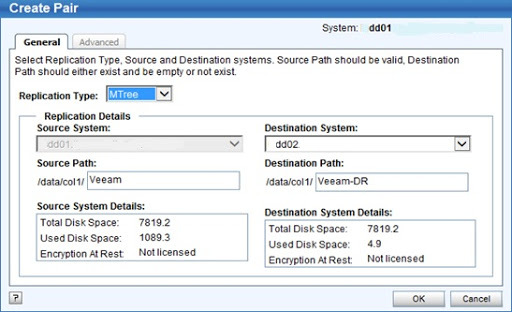 On the Create Pair screen, select MTree as the Replication Type and then specify the Source Path, the Destination System and the Destination Path. Click OK.
3. 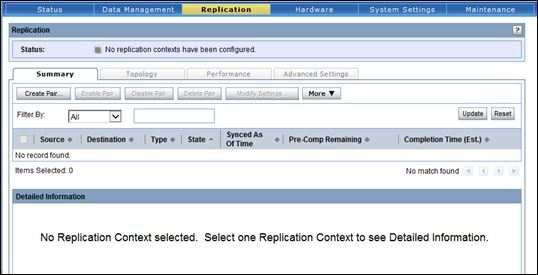 DDEM begins to build the replication pair as shown below; it also begins the initial replication between the systems. Click Close. 7. On the Create Share screen, enter a Share Name, Directory Path, and Comment then click OK.
1. 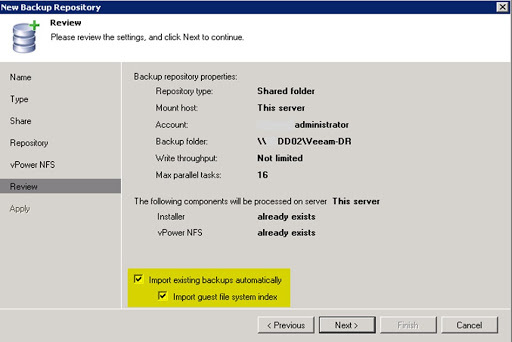 Right-click Backup Repositories and select Add Backup Repository. 2. 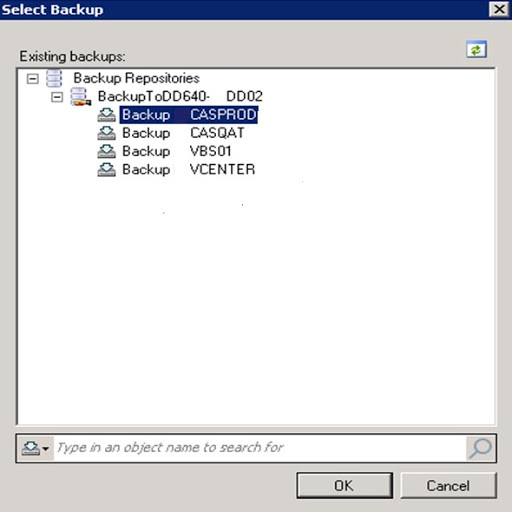 On the Name screen, enter a Name for the backup repository and click Next. 3. On the Type screen, select Shared folder as the backup repository type and click Next. 4. 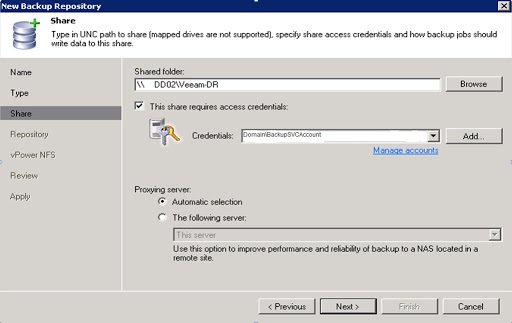 On the Share screen, enter \\DD02\Veeam-DR as the Shared folder, then specify credentials with read/write access to the share on the Data Domain. Under the Proxying server section, select Automatic selection and click Next. 5. 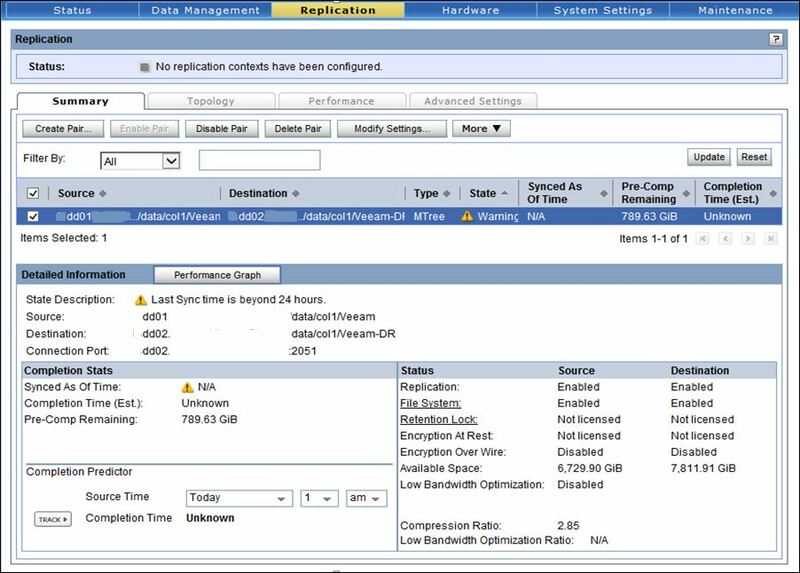 On the Repository screen, set the Limit maximum concurrent jobs count to a number the backup repository/device can handle and click Next. 6. 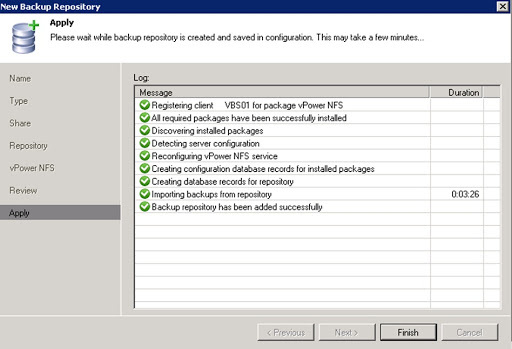 On the vPower NFS screen, select Enable vPower NFS server and select This server. For the Folder, accept the default and click Next. 7. On the Review screen, review the proposed settings and check Import existing backups automaticallyand Import guest file system index. Click Nextto create the new backup repository. 2. Click Storage and then change the Backup Repository to DD02. 3. With DD02 selected as the backup repository, click Map backup. 4. 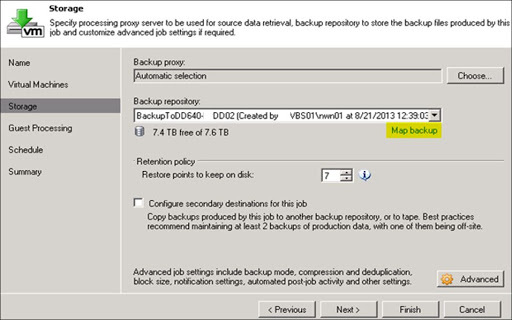 On the Select Backup screen, map to the corresponding backup job on DD02 and click OK. 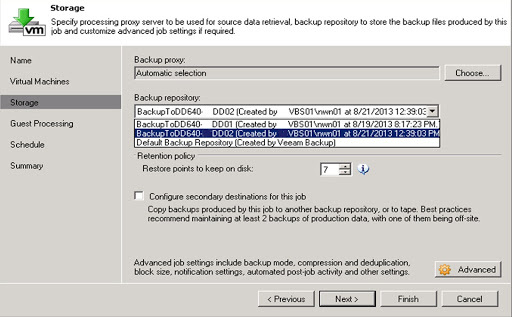 When returned to the Edit Backup Job window, click Finish and repeat steps #1-4 for remaining backup jobs to complete the failover process.